A few weeks ago my writer friends and I got into a heated discussion about the importance of blogs while drinking sangria (this is what writers do, trust me). Two of us argued on the side of the importance of blogs, while the other said he did not see their importance. The two of us on the pro-blog side cite blogging as a crucial tool for writers. We believe blogs are a way to connect with your audience, to define your platform as a writer, and to network with other writers. My anti-blogging friend thinks there is too much bad writing on the internet and doesn’t think he needs a blog to promote his writing; he’ll let his writing do that for him. I agree with the notion that there is a lot of bad writing online, but there was a lot of bad writing before anyone could upload their dinosaur erotica to the internet (it’s real, I swear). The point is for audiences to know how to discern between good and bad writing. When a person walks into a bookstore, they don’t blindly grab at books and buy whatever their hands land on. You still read the blurb on the back and scan the first page of the book. That same principle should be applied to writing online. There is so much material online that nobody has to waste their time reading something they’re not interested in. Read a few paragraphs and if you’re bored, move on. I do this all the time, even on websites I love. As far as “letting your writing speak for itself,” well it’s a lovely notion, but it doesn’t work in contemporary society. I’ve heard time and time again that “writing doesn’t exist in a vacuum.” I can’t toil away in my home waiting for someone to discover my genius. Contemporary writers need to be proactive. Just as we submit to journals or send manuscripts to agents, we should utilize the tools the internet has to offer in order to get our name and our writing in front of more people. If you know how to use it correctly, the internet is a great place for a writer. 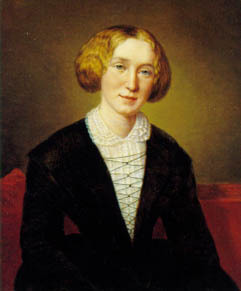 I wonder what George Eliot would think of blogs? I wonder what she would think of dinosaur erotica??? The blog discussion eventually escalated into argument territory, which eventually pushed me onto my feminist soapbox. I explained to my (male) friend that I can appreciate the internet as a way to show the world my writing because traditionally, that hasn’t been as easy for women as it has been for men. Think of the lopsided amount of literary awards given to men over women. Think of how male writers write about families and its called “literary fiction,” but when women do it it’s often called “chick lit.” Think of writers like George Eliot who had to use a fake name in order to publish her work, and that less than twenty years ago Joanne Rowling was told to shorten her name to J. K. Rowling because boys would be more likely to buy Harry Potter if they believed it were written by a man. The traditional publishing industry still has leaps and bounds to take before it treats women equally. But the internet lets us do it ourselves. It lets us share our writing on our own terms and to build community with other writers. That’s not to say that I don’t want to see my work in book form someday. I want to walk into a bookstore and hold my book. But I also want to run home from the bookstore and write about that experience on my blog, have someone else read about it, and make a comment or share it with someone else. Call me optimistic, but I believe we can find balance between the traditional and contemporary means of sharing our writing.